Steven Culp, owner of Graphitti Sign & Graphic Studio in Franklin, TN, recently completed a unique project for Alan Jackson, a well known country singer, during the Nashville Predators Stanley Cup run. Graphitti hosts concerts at their operation once a quarter and they even have some wrapped guitars on display in their showroom, which helped give them a bit of attention. Steven’s company has also helped out Alan Jackson’s Bar with rush projects quite a few times, so Alan trusted them with this job. Alan Jackson was set to play a free concert outside Bridgestone Arena before the Stanley Cup Final game. 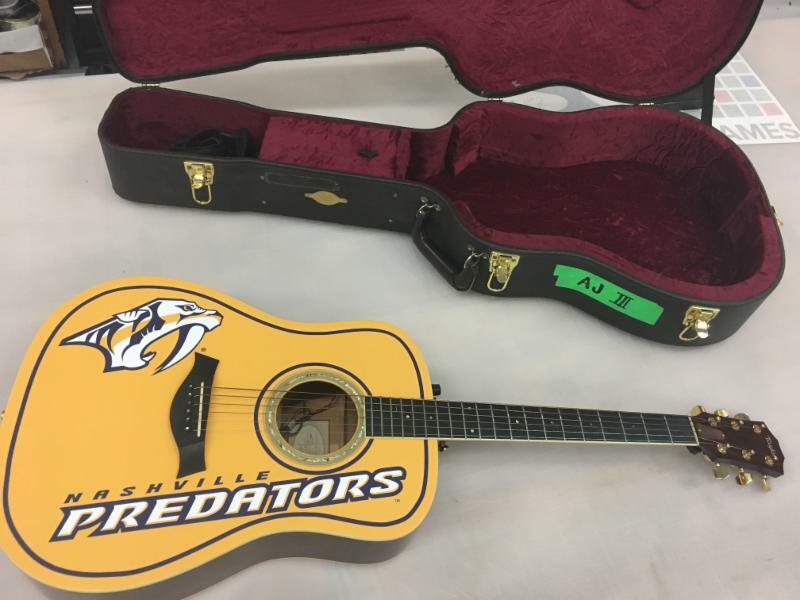 To get him ready, Steven and his team needed to pick up Alan’s guitar, build a digital template, create a Predators design, produce the wrap, disassemble the guitar, wrap it, reassemble the guitar and return it to Alan, all within 24 hours after they received the job. Steven hopes his company is able to to more jobs like this. Steven said his favorite part of this project was watching Alan Jackson play his guitar in front of 40,000 people and all the articles praising Alan for his guitar with the Predators theme.